London South Bank University's (LSBU) law students have been celebrating triumphs in UH/Blackstone's National Criminal Advocacy Competition and in a number of mooting competitions. (LLB) law students Zulfa Ahmed and Freddie Palmer successfully represented LSBU in the first preliminary round of the UH/Blackstone's National Criminal Advocacy Competition 2013. The UH/Blackstone's National Criminal Advocacy Competition is a valuable opportunity for law students throughout the country to take part in a series of mock trials, giving them the chance to gain essential practical skills fur their future careers. Throughout the round, students Zulfa and Freddie were able to draw on the knowledge and skills gained as part of the CILEX accredited Crime and Litigation module, which forms part of the (LLB) Law course. Having successfully contested a number of applications made by the prosecution, Zulfa and Freddie completed the preliminary round twenty points ahead of the home team. LSBU law students were once again proving they were a cut above, when they celebrated two mooting triumphs at the Oxford University Press/ BBP Law School mooting competition, and at the 2013 London Universities Mooting Shield Competition. In the former, LSBU law students Akim Tejan-Cole and Ravi Suchak progressed to the third round after defeating the Open University. The second round was judged by Mr John Cherryman QC who also named Akim Tejan-Cole as 'man of the moot'. The London Universities Mooting Shield League is an intense mooting competition between 10 London universities. 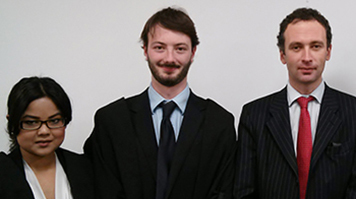 Third Year Law (LLB Hons) students Joseph Shead and Freddie Palmer scored a substantial victory over City University. Paul Wynell-Sutherland, Director of Mooting for the Law Department at LSBU, said "I am absolutely delighted with the students who have worked so hard and taken part in these competitions. They are a credit to themselves and the University as a whole." To find out more about law courses, use our Course Finder.